Can you name the most-popular sport in Western Pennsylvania in 2005? If you guess football, you’re wrong. Baseball? Nope. Basketball? Sorry. Try pingpong. That’s right, pingpong. OK, so maybe it really wasn’t at the top of the list, but the little white ball used in the sport has had a gigantic impact in the region. That summer, hockey fans and players in Western Pennsylvania quickly became huge fans of that little white ball. That’s because it gave the Pittsburgh Penguins the first-overall draft choice and the chance to select a highly-touted prospect named Sidney Crosby. Since joining the Penguins, Crosby has dazzled fans with his magic on the ice and captivated them off it with his charismatic personality. 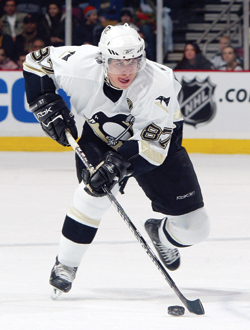 Following a rookie season in which he became the youngest player to reach 102 points, Crosby continued his mastery during the 2006-07 season. He became the NHL’s youngest scoring champion and was named the league’s MVP – all before his 20th birthday. His personal success translated into positive results for the Penguins. Crosby led the team to a 47-24-11 mark and 105 points – a stunning 47-point improvement over the previous season. It was the fourth-biggest turnaround in NHL history from one year to the next and earned the Penguins its first Stanley Cup playoff berth since 2001. Yet, Crosby may not even be aware of his biggest achievement – a huge hockey boom in Western Pennsylvania, as well as across the country. Pittsburgh-area rinks are buzzing with an influx of hockey players – young and old – who have rediscovered the sport since The Kid’s arrival from Cole Harbour, Nova Scotia, in 2005. And if they want to watch him play, whether it’s in Pittsburgh or at one of the other NHL arenas in the United States, that’s alright by him. “We have a pretty exciting team. People see our team and see the energy we have,” says Crosby. Sidney Crosby has taken Pittsburgh by storm in his first two seasons in the NHL.The Penguins boast a bounty of young, exciting talent with the likes of Evgeni Malkin, Jordan Staal, Marc-Andre Fleury and Ryan Whitney – among others – but it’s Crosby who leads the way. Crosby has done for Western Pennsylvania what Wayne Gretzky did for California back when “The Great One” put hockey on the map once he was traded to the Los Angeles Kings in 1988. Granted, hockey in California had farther to go than it did in Pittsburgh, which has produced a number of talented players and competitive teams, but there’s little doubt that interest in hockey in the Pittsburgh area is soaring. Crosby’s impact has helped boost the Pennsylvania Interscholastic Hockey League – a growing high school circuit, which includes the Penguins’ Ryan Malone and the Flyers’ R.J. Umberger among its alumni. “The kids are coming. We knew this three years ago,” says PIHL Commissioner Ed Sam. “My thoughts were they’d come in at 5, 6 and 7 years old. What we saw this year was this influx into high school hockey, too. I can’t believe the numbers we’re getting. Paul Day, a USA Hockey Mid-American District director, agrees. When “Super” Mario came to the Steel City in 1984, there were only eight rinks in all of Western Pennsylvania. Today, there are more than 25 sheets of ice and more kids flocking to them all year round. 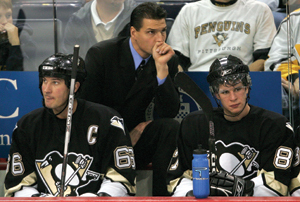 The impact that Mario Lemieux (left) had on hockey in Pittsburgh continues to be enormous. The Penguins, and the rest of the NHL, are hoping Sidney Crosby can take the game to the next level of popularity.Crosby’s influence hasn’t been seen around the Pittsburgh area since his landlord Mario Lemieux burst onto the scene as a 19-year-old rookie. Crosby resides with the Lemieux family in Pittsburgh during the NHL season. “Mario’s impact was huge. The difference is, Mario made hockey happen here. It was definitely a niche sport,” Shuttleworth says. “Mario made everyone want to play hockey, especially if you went to one of those lucky few high schools that had a team. Crosby, who turned 20 on Aug. 7 (he was born 8/7/87 and wears No. 87), shrugs off any comparisons. He knows the NHL is not a one-player league. “It’s not something I put solely on my shoulders. We have a lot of guys in this league who can bring excitement, that’s for sure,” says Crosby, who won a USA Hockey National Championship with Shattuck-St. Mary’s in 2003. Gretzky and Lemieux are two NHL greats Crosby constantly gains comparisons to, not only for his excitement on the ice, but for his ability to serve as an ambassador to the sport on a national and international level. Dave Hanson, general manager of the Robert Morris University Island Sports Center – a former NHL player and one of the famous Hanson Brothers from the movie “Slap Shot” – believes Crosby is worth mentioning in the same breath as those two Hall of Famers. Since coming into the league in 2005, Sidney Crosby has helped the Pittsburgh Penguins become one of the top drawing teams in the NHL. Note: In 2006-07, the Penguins finished with 30 sellouts, the third-highest total in team history. “I played when Gretzky broke in and I played against Mario when he was a rookie. You had the same phenomenon then because he was a young guy,” Hanson says. The timing couldn’t be better for the NHL, which is still licking its wounds from the yearlong lockout that scuttled the 2004-05 season. It’s not just Crosby’s highlight reel goals that have caught the attention of fans; it’s his good looks, boyish charm and a passion for the game that has won over fans, old and new alike. “For a 19-year-old, [Crosby] always says the right thing,” says Day. “There’s nothing you hear from that young man that doesn’t tell you he’s a bona fide player. He has a lot of respect for his fans, his family and the community – everything. Crosby’s popularity is soaring. His No. 87 Penguins jersey was the top seller on Shop.NHL.com during the 2006-07 season and he was the leading vote getter for the NHL All-Star Game with 825,783 votes – 161,852 more than Joe Thornton, who finished second. Oh, and good luck getting a ticket at rinks around the league when Crosby and the Penguins are slated for a visit. The NHL hopes to continue to market Crosby across the United States and Canada to promote the sport. “That’s been a primary focus since lockout. All our players, especially Sid in particular, are happy to do anything to help grow the game,” Daly says. “His exposure on NBC and Versus was very high profile. They look heavily at the Sid factor and the Penguins factor. That’s true with television stations in Canada as well. “It goes with being the face of the league. This league was very fortunate for 20 years to have a guy like Wayne Gretzky out front as the face of the league. I think Sid clearly has big shoes to fill in that regard. Here are five American players to watch for this year, as reported by Kyle Woodlief of the Red Line Report. Has all the physical attributes to be a stud power forward. Is already 6-foot-4, 210 pounds, and is a decent skater who is tremendous on the cycle down low. Uses his body and long reach to shield the puck from defenders and bull his way to the net. Difficult to separate from the puck. Has good hands in the slot and a nice release. A tough as nails (both physically and mentally) defender who will be a team leader wherever he goes due to his outstanding attitude and work ethic. He hits hard and often, is very defensively aware, makes a crisp first pass out of the zone, always plays within himself, and is just beginning to emerge offensively. Has good size and technique, and already got a lot of experience with Guelph last year against high caliber shooters in the OHL. Moves well side-to-side and exhibits nice athleticism. Plays “quiet” in net without a lot of wasted movement. He needs to work on catching the puck cleanly and handling it around the crease in general. A huge winger with tremendous physical tools. At 6-foot-4, 197 pounds, he is lean and athletic with a huge frame and should fill out into a huge man. Has a long, smooth skating stride and great reach that he uses to shield defenders from the puck. Has an excellent release on a heavy snap shot.